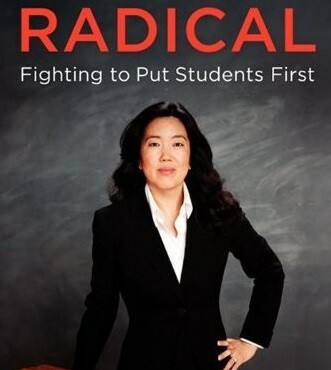 There have been some incredible stories coming out this weekend, not the least of which is that of uber-reformy Michelle Rhee. Rhee proudly boasts of being a public school parent, but it appears one of her kids attends an elite 22K per year private school. This would not be of any consequence whatsover, but for two things. One, of course, is that she lies about it. The second is the school she chooses for her kids does not indulge in the high class sizes or relentless testing she champions for our kids. Had I sent my kid to a school with small classes and no high-stakes testing, I'd be working to ensure others got it as well. As it happens, I am a real public school parent, and my kid suffers through all the nonsense Rhee and her minions inflict on our country. They are aided and abetted, of course, by leaders like Duncan, Cuomo, and Bloomberg, all of whom seem to value lower taxes on their BFFs above the welfare of American children. Not only that, but yet another reformy "miracle," like the one on Texas, and the one in NYC, has turned out to be an utter fraud. Beverly Hall worked her magic in Atlanta, and was widely praised for the incredible progress she made. It turned out, though, that most of the magic was not done in the classroom, but in offices stocked with abundant erasers. This, of course, is what happens when you have a real investigation, rather than the cursory one Rhee had in DC. The question is, will Rhee BFFs like Obama and Duncan demand a real look at what happened while the reformiest of the reformy was in charge? And the answer, of course, is almost certainly no. Meanwhile, the witch hunt against working teachers continues. The NY Times appears to bemoan the fact that only a small percentage of teachers are being labeled failing under new junk science-based evaluation systems. This is dangerous on two levels. First, reformy folks like John King, who will likely as not impose such a system on city teachers, is likely to ensure larger numbers are ensnared in his Flat Earth net. Second, it reinforces the myth of the ubiquitous bad teacher. Now I'm not saying there are no bad teachers, but I am saying it is not the epidemic reformy hedge-funders and newspaper owners would have us believe. There are certainly means of dealing with them, and creating a system where disingenuous self-serving demagogues like Rhee and Bloomberg can indiscriminately fire inconvenient teachers will not represent any improvement whatsoever. It's amazing that people like Rhee are permitted to continue targeting working teachers for conditions well out of their control, while dodging any accountability whatsoever. Equally amazing is that pockets of the press are beginning to take note.